Top Extra Income Sites That Are Actually Worth Joining! 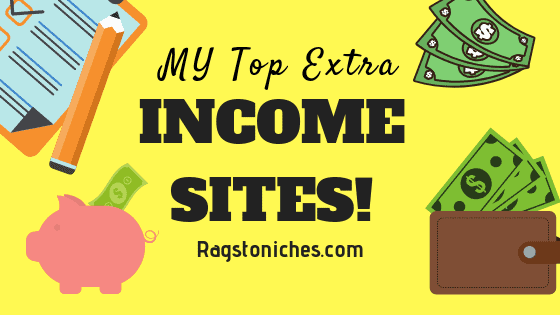 Today I’m going to share with you some my top extra income sites. These are some of the best ones that I have found personally to date, (and that I enjoy!). You can let me know if you have other ideas in the comments below. If you’re looking to make a little bit of extra cash on the side; then these websites may be of interest to you. None of these sites are going to make you life changing money; but they can make you a little extra – or simply help you save money! While these sites won’t make you much, they’re still fun sites and ALL free to join. Additionally, you can join as many of these sites as you like to help give your income a little boost. Mini Roundup – These Made My List! Swagbucks ($5 sign up bonus). Prolific, (High paying survey site, with no screening out). 1. Swagbucks! – A Great All-Rounder. Swagbucks has been my number one choice for a long time now, partially because it is still one of the sites like this that I continue to use now. There are various ways you can earn and save – from earning cashback, taking surveys, playing games and even just by surfing the web via their search engine. You can sign up from many countries Worldwide. You can cash-out via a large variety of gift cards, or PayPal. It’s a really fun site and it’s saved me a tonne of money over the few years I’ve been a member. Click below to check it out and claim their free sign-up cash bonus of $5! (Other bonus amounts too, depending on location!). You can read my review here – or just sign up below. 2. Prolific Survey Panel – Best For High Paying Surveys! If you’re not in the US, don’t dismiss this one just because they pay in pounds! This is a great survey panel that pays way more than regular surveys. A plus point of this platform, is that you will not get thrown off of the surveys! You fill in a bunch of profiling questions and the surveys are matched to you, so you don’t have to worry about not qualifying. To be more precise, Prolific surveys are actually, “studies.” They are studies created by students, for the purpose of scientific and academic research. As such, the surveys/studies are actually far more interesting than other surveys you will have taken in the past. You can cash out your earnings from Paypal from just £5. You can join Prolific from many countries around the world & they are looking at going global soon. Right now, you’re paid into PayPal via pounds, but you can easily change the currency from there in order to cash out. How many studies you’ll be able to do will vary on many things, but it’s worth checking out. I’ve made more in with them in one day, than I have using other survey sites for months. Read my full review here – or simply join below. 3. QMEE – The Best For Browsing The Web. By downloading the free Qmee browser bar extension, you can earn cash every time you search the web. You can also now earn from paid online surveys as well. Qmee shows you additional results in a side bar when you search for products in Google, Bing, Yahoo and even Amazon. When you click their alternative suggestions, you earn a small amount in return. You can then withdraw your earnings via Paypal, or Amazon giftcard. Qmee also now have an App, that I’ve really been enjoying using. 🙂 Read my Qmee review here, or simply check it out below. 4. ReceiptHog – Fun App For Cashback! There are lots of cashback related apps – Dosh App being an option in the US, or Checkoutsmart a fun on in the UK. However, you can also earn money by scanning your receipts. Plus, there are SO many different receipts you can scan and if you don’t get points, you can get prize draw entries. The most fun about this is the little piggy fruit machine! You can earn extra points and prizes with your spins. Read my review here. Or simply check it out below. At the time of writing, this app is only available in the USA and UK. 5. DealSpotr – Earn Cash For Posting Deals. Dealspotr is a site where you can find deals and discounts online – and get rewarded for it in the process. It’s a bit like a mix between a social media network and a coupon/deal website. Members post all the deals on the website & also edit them. You get awarded points for various activities on the website, which can be saved up and exchanged for Amazon vouchers. If you’re a blogger, you could also earn bigger rewards. Read how here. If you want to read more about how Dealspotr works, read my review here. Alternatively, just click below to get started – you get 1000 extra points when you sign up via my link below. 6. User-Testing – Best For Testing Websites. User-testing is a site that will pay you $10 each time you test a website. Testing websites involves them recording your screen and you talking in a microphone through a series of tasks. The tasks are very easy to follow and you’re given full instructions. Each test only lasts around 15 minutes, so it pays pretty well! For more in depth info, check out my full review. If you’d like to go to the site directly and check it out, simply click to join below – it’s completely free. My Top 10 Best Survey Sites UK. There are survey sites included that allow members from many countries – (not just US/UK). Also, please let me know in the comments if you’d like to make any suggestions, or have a site in mind that you’d like me to review. What About Making MORE Than Just Pocket Money Online? I hope you enjoy checking out all those extra income opportunities. While they are fun to join, they’re not something that’s going to boost your income all that much! If you’re looking to make either a part-time, or full-time income online eventually; then building your own business online is the way to go. I personally make the most online from having my own blog and I wrote an in depth step-by-step post here – explaining exactly how you can do the same. I also recommend you check out the free training here, as it will give you an excellent insight into how you can grow an income online. There are many ways you can start building an income on the net; but the posts below will help you out! Learn how to start a money making blog! 40+ ways to make your first dollar online – and scale it up! I hope you have found this info useful! How do you make money online? Are you building an online business?